The city of Ilaria, the unfortunate bride. 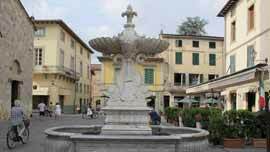 Lots and lots are the definitions of Lucca, one of the more distinguished italian cities comparable to a costly case containing invaluable historic and artistic treasures. "Why do you love Lucca so much? Because it is a village. Although its marbles, its sky is light.". These two lines underline the integrity of a historical-centre perfectly enclosed by a town-wall that has always been kept intact. Moreover this definition stresses the quality of the monuments characterizing this place and the strong emotion they arouse with their vertical and silhouetted against the sky profile. St. Martin Cathedral, St. Michael in Foro Church ( the heart of this town) or St. Frediano Church are examples of the architecture typical of Pisa and Lucca. The same emotion felt by the pilgrims arrived in Lucca following Via Francigena, as they knelt down in front of the Volto Santo, a wood cross (following the tradition it was taken in Lucca from Terrasanta). The same emotion felt by the tourists admiring Ilaria del Carretto's grave, made by Jacopo della Quercia and nowadays in the Cathedral: this grave is one of the more important examples of italian sculpture. Ilaria was Paolo Guinigi's wife. In 1405 she died as she was still very young. 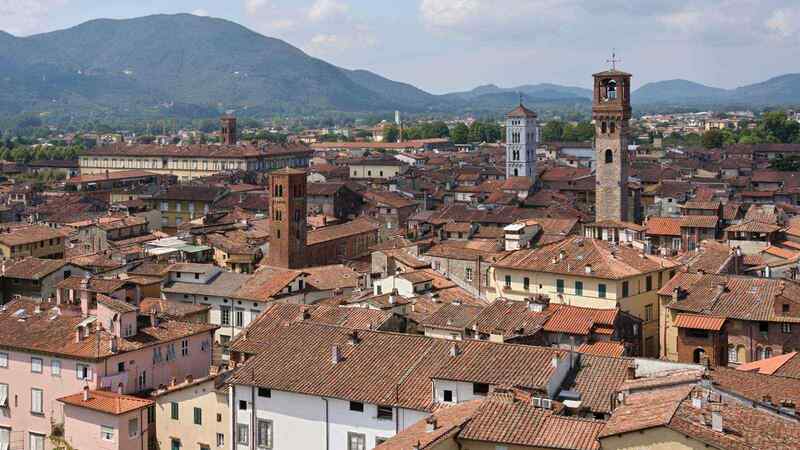 Another relevant monument you can enjoy in Lucca is the tower belonging to Guinigi's palace: on this tower, considered the symbol of this city, grow some imposing holm-oaks and from its top you can enjoy a wonderful sight, with the town-wall's profile perfectly recognizable. The Roman amphitheatre (II c.) holds 10.000 spectators and its shape is still recognizable (if you go round the square along Via dell'Anfiteatro). Nowadays this amphitheatre represents the ideal scenography for outdoor shows even if, some years ago, it was simply the square where the fruit and vegetable market was located. You have to gradually find out the beauties of this city; they are to be found in the churches, in the streets, in the palaces, in the squares, in the museums. Some of these museums are really interesting as, for examples, the National Museum in Villa Guinigi, an impressive villa built during the XV century as the master of Lucca desired).